In Alabama, the stories of haunted bridges fill almost every small town and county. Cry baby hollows and cry baby bridges bring stories of children lost to tragic ends in turbulent waters. Interestingly, there is a similar story in Vermont. There is a haunted bridge that is said to be lost in tales of woe. However it isn't a sweet babe that haunts this bridge, but an angry woman. Emily's Bridge is located in Stowe,Vermont in the lovely valleys of the Green Mountains. Emily's Bridge is mired in rumor. Its true history is somewhat bland. 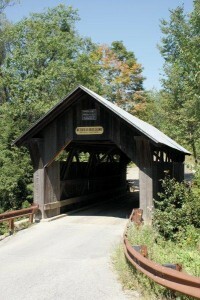 It is the oldest remaining covered bridge in the Stowe area. The stream beneath the bridge once had a little gold in it, but not enough to make anyone rich. The bridge is picturesque and warn by time, but it is the ghost that haunts it that makes it famous. No one knows for sure who Emily was. Some say she was a young woman who had her heart broken by her true love. Desperate and despairing, she threw herself into the water below the bridge to end her life. Others say she was a mother, whose husband ended his life and who lost her babies. In a fit of despair, she also ended her life. Whoever Emily was, the stories of the white lady of Emily's bridge are terrifying. Emily is a vengeful ghost. It is said that after she is seen throwing herself off the bridge, she often chases her observer. Some who catch a glimpse of Emily, are said to leave covered in cuts and bruises from her brutal attacks. Strange noises are often heard on the bridge. Screams, scrapings, and footsteps are said to haunt the quiet nights there. Those who park on the bridge say that they hear Emily tearing and scraping at the outside of their cars. Whoever Emily was, her sad story endures, even in the shadows of rumor and legend, because her ghost story endures. As long as her tragic screams are heard in the shadowy nights of Emily's bridge, her story will remain. I've only just finally seen 'The Woman in Black', which was the creepiest film I've seen in a long time, so the idea of encountering a vengeful female ghost on a bridge sounds particularly terrifying. І could not rеsіst commеnting. Well wгittеn!